Rumours and chatter abound about a recent move by Google to release a system for developers called OpenSocial, a new, open, Web API. In essence, Google appear to be presenting a set of common APIs for building social applications across the web. OpenSocial is aiming to provide the framework that will enable developers to develop social applications which can be used on any web-site or social network that supports the OpenSocial standard. Looks as though a formal announcement from Google will be made in the next day or so. 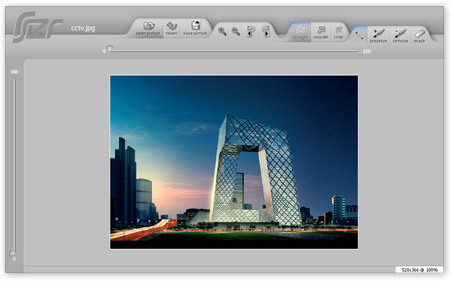 rsizr is a flash-based web application that allows you to resize images. It is a free on-line service that uses seam carving to allow you to change the size of an image without distorting areas of interest. Simply upload an image file (JPG, PNG or GIF) which must be less than 2880 pixels in width or height. When you're finished you can save a copy of your edited image on your computer. The Windows Live ID Service is the identity and authentication mechanism provided by Windows Live. Currently there are over 380,000,000 users that have Windows Live ID credentials. Mentioned during a session at the recent MixUK, the Windows Live ID Web Authentication 1.0 SDK provides an easy-to-use authentication system that allows that allows the Windows Live ID service to verify the identity of visitors to a Web site. One advantage of this approach is that a user doesn't have to use separate login mechanisms for each site that they visit. Windows Live ID provides you with a unique, site-specific identifier for each Windows Live user who signs in to your site. Web Authentication also enables you to incorporate Windows Live controls into your site. Web Authentication works by sending your users to the Windows Live ID sign-in page by means of a specially formatted link. The service then directs them back to your Web site along with a unique, site-specific identifier that you can use to manage personalized content, assign user rights, and perform other tasks for the authenticated user. Sign-in and account management is performed by Windows Live ID, so you don't have to worry about implementing these details. Windows Live ID profile data is not shared with your site. 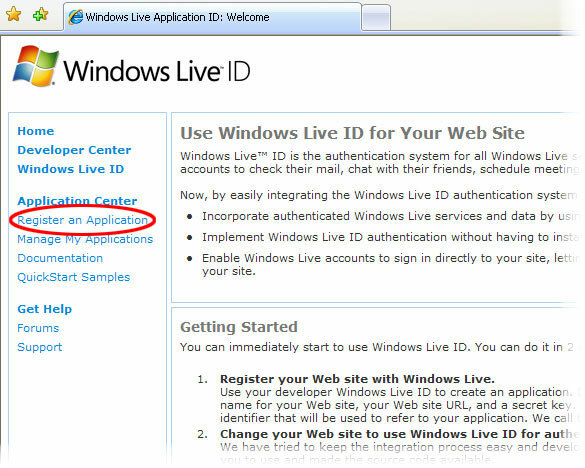 To implement Windows Live ID, you must register your Web site with Microsoft® as an application and receive an application ID for use with the service. The application name is a unique and friendly name that you use to refer to your application. The secret key is a shared secret between you and Windows Live ID. Windows Live ID uses this key to encrypt and sign all tokens that it sends to your site. You should choose a secret key that is difficult to guess and create security procedures to manage this key. and you're all set - the application ID you get is a 16-character string that represents your application which you'll use later. To test out the system, I simply extended the python sample to run from a web-site (which I specified when registering the application) and needed to change the Application-Key.xml file which was supplied as part of the python sample, with details of my registered application. 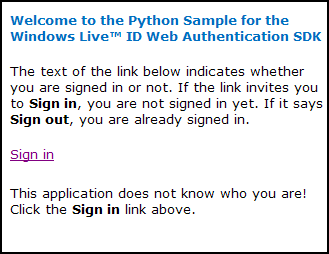 In summary, I found it quick and easy to set up a simple test application using the Window Live ID Web authentication process which I can use in the future across my collection of web-sites as a single mechanism for user authentication. 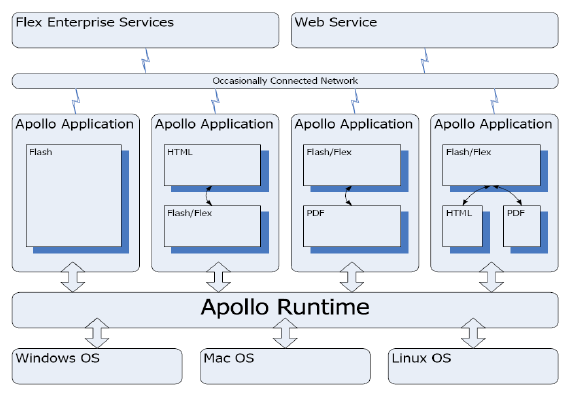 Apollo is a cross-OS runtime that allows developers to leverage their existing web development skills (Flash, Flex, HTML, Ajax) to build and deploy desktop Rich Internet Applications (RIA’s). You can also read the Apollo FAQ from Adobe Labs. Apollo is targeted for a pre-release version on Adobe Labs in early 2007 and Adobe is aiming for the first half of 2007 for a full-release. AfterCAD Software Inc recently claimed to have introduced the First True AJAX based CAD application. AfterCAD InSite is a server application that organizes and serves CAD drawings to anyone with a web browser. InSite serves up 2D and 3D CAD data in the same way that Google Map data is served to users. The company have applied for a patent on the technology, which is not restricted to CAD data and could be applied to any raster image. Can CAD software run in a Web browser? At last year's Autodesk University, the company's now-ceo Carl Bass thought not, because it's too 'heavy' — too much data. He thought there was a place for BOMs and markups, which don't transmit nearly as much information. If AutoCAD 2007 places a burden on 2GHz desktop computers, how could Web browsers cope? View22 of Ontario, Canada, thinks they have the makings of just such a product, now three years in the making. Their approach was to work the problem backwards: instead of positing themselves at the CAD end (seen by all other CAD vendors at the starting point), they began at the customer end — the final resting point seen by 'normal' CAD companies. In this case, the customer is either B2C business-to-consumers or B2B business-to-business entities. Companies like General Electric and Playworld Systems have replaced hundreds of seats of AutoCAD with View22. The company's little known secret is DynaCADD. Or, as View22's Mark Zohar put it, DynaCADD's DNA runs through them. What this means is that these people have CAD experience from the past, and their product includes CAD concepts like object snaps. News is a little bit old but does this indicate a trend for trickling Longhorn functionality into XP ? Microsoft officials for months had been telling customers and partners that Microsoft had no plans to upgrade IE until the company rolled out its Longhorn client operating system in 2006. At the most, Microsoft might introduce some minor downloadable IE add-ons before then, officials said last year. In justifying its decision against upgrading, Microsoft had argued in antitrust cases in both the U.S. and Europe that IE was an inextricable part of the Windows operating system, and no longer a standalone product.